Basic Beekeeping: Save $145 On Our Online Courses Happy Thanksgiving! Save $145 On Our Online Courses Happy Thanksgiving! We at Long Lane Honey Bee Farms want to take a moment to let you know how thankful we are for having you as a customer. Here are a few ways we hope to make your Thanksgiving holiday special along with a Black Friday spectacular offer! Enjoy a moment with us this Saturday. We will be open 10am - 3pm central time. If you have beekeeping questions David will be here and available to answer your questions in our store (no phone calls)! We also have freshly harvested honey for sale from our own hives. Also, we have a limited number of Winter-Bee-Kinds available this Saturday. Take a fun, fall drive and visit Long Lane Honey Bee Farms this Saturday, Nov. 10th. Our online beekeeping courses have been enjoyed by hundreds across the country. We are making a special offer from now until Thanksgiving. For the next 15 days, you can purchase all 6 courses for only $199--a savings of $145! This is your opportunity to spend the winter enjoying these courses. No rush to complete the courses. Take them at your leisure, from the comfort of your home at your own pace. There's no deadline or start time. You have all winter to enjoy the courses and longer if needed. Getting Your Bees Through The Winter. Click here to take advantage of the amazing savings we are offering as our way of saying thank you to all our amazing customers. Going somewhere for Thanksgiving or Christmas and need a gift for the host? 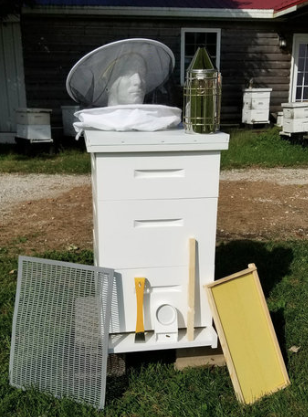 PACKAGES OF BEES AVAILABLE WITH KITS NOW!! Our Hobby KIT is a starter kit with a package of bees and a mated queen. FREE SHIPPING. Bees Must Be Picked Up At Our Location. This is the least expensive way to get started. You will need to add more boxes or additional items to this hive as it grows, but you can purchase this kit to get started without paying for the full hive at one time, so it's a little easier on the wallet. Buy other boxes as you need them. Click here for more information. 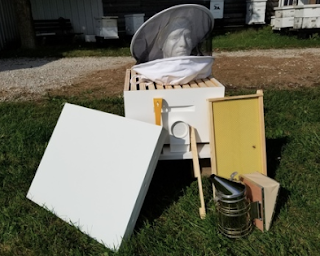 Sometimes you just need to text or call a certified master beekeeper and find out what the heck has gone wrong with your bees. IS IT SAFE TO START WITH USED EQUIPMENT? We just started shipping out Winter-Bee-Kinds this week because the weather has cooled off. Be patient because they are being shipped out in the order in which the orders were placed and we have many, many orders to get through. If you have not placed your order, please do so now so that you will be guaranteed to receive a Winter-Bee-Kind this season.This product is in heavy demand. Please be patient. Click one of the links below to secure your order.